The Cincinnati Bengals, an AFL expansion team for 1968, started off their inaugural season on September 6 at San Diego. At the helm was Paul Brown, already in the Pro Football Hall of Fame for his near-legendary work with the Cleveland Browns from 1946 through ’62. After five years out of the game, he was back as a part-owner, general manager, and head coach. The first-year Bengals were a typical collection of fading veterans and untested young talent. First draft choice Bob Johnson was to anchor the line at center, there was a promising rookie halfback in Paul Robinson, as well as HB/WR Warren McVea, and while a deal with Miami had brought former minor league QB John Stofa to the team, Dewey Warren, a rookie out of Tennessee, was behind center for the debut. The Chargers, coached by Sid Gillman, were coming off of a respectable 8-5-1 record in ’67, although in the tough Western Division that was good only for third place. The offense was typically explosive and contained QB John Hadl, flanker Lance Alworth (who was coming off of an injury-plagued season), and HB Dickie Post, among others, but the defense was less impressive and still in rebuilding mode. There were 33,687 fans on hand at San Diego Stadium for the nationally televised Friday night game. Taking the opening kickoff, the Bengals drove impressively down the field for 72 yards in eight plays. Warren McVea had a run of 28 yards and Paul Robinson had a 14-yard gain. Robinson capped the series by running two yards around end for a touchdown. 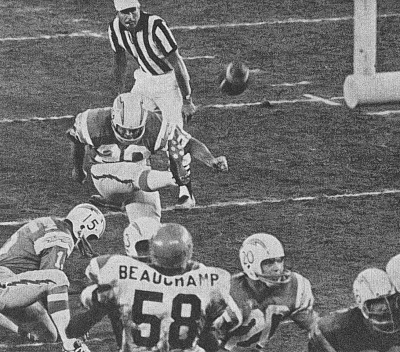 The Chargers drove into Cincinnati territory but stalled at the 34 and Dennis Partee kicked a 42-yard field goal to get the home team on the board. On San Diego’s next possession, and still in the opening period, Dickie Post broke away on a sweep for a 48-yard TD. With Partee’s extra point, the home team carried a 10-7 lead into the second quarter. Neither offense could move consistently during the remainder of the first half, but the Bengals managed to tie the score with a 22-yard field goal by Dale Livingston. In the second half, John Hadl began to exploit weaknesses in Cincinnati’s pass defense. The Chargers moved 76 yards to start the third quarter and FB Brad Hubbert plunged into the end zone to put the home team in front. Partee added the extra point that made it 17-10. TE Willie Frazier (pictured at top), who caught 57 passes and was an AFL All-Star in 1967, had lost his starting job to Jacque McKinnon and didn’t get into the game until the second half, but he made an impact when he did. Up by four points late in the third quarter, Hadl threw down the middle to Frazier, who caught the ball at the 20 and carried three defenders into the end zone for a 48-yard touchdown. Partee’s extra point attempt was blocked but it had no effect with the Chargers up by ten. Attesting to the physicality of the game, Lance Alworth, who was clotheslined after his first catch by CB Fletcher Smith, was ejected in the fourth quarter for fighting. But the Chargers were able to keep the visitors in check for the remainder of the contest. In the closing seconds, Frazier pulled in a second scoring pass, this time from five yards out to secure the win. San Diego came out on top by 29-13. The Chargers dominated in total yards (554 to 226) and first downs (27 to 13). They were impressive on both the ground and through the air, gaining 229 rushing yards and 325 via passing. However, San Diego was also hurt by 10 penalties, at a cost of 100 yards, while the Bengals were flagged five times. Each team turned the ball over twice, and the Bengals also gave up two sacks. John Hadl completed 20 of 37 passes for 325 yards and two touchdowns with none intercepted. Dickie Post ran for 140 yards on 16 carries that included the one long TD and Brad Hubbert added 54 yards and a touchdown on his 11 attempts. WR Gary Garrison led San Diego’s receivers with 5 catches for 101 yards while TE Jacque MacKinnon added four receptions for 87 yards, Lance Alworth four for 58, and Willie Frazier contributed three catches for 66 yards and the two touchdowns. 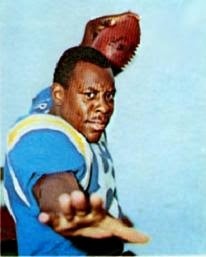 Dennis Partee (pictured below) had an uneven performance in his first game as placekicker/punter for the Chargers, connecting on one of three field goal attempts and failing on his last two extra point tries. For the Bengals, Dewey Warren received praise for his poise after completing 14 of his 26 throws for 125 yards, giving up one interception. Paul Robinson gained 33 yards on 16 rushing attempts that included a TD. FB Tom Smiley ran for 26 yards on 9 attempts and led the club with 6 catches for 51 yards. “If we lose every game this year and are contenders in three years, I’ll be satisfied,” said Paul Brown, attesting to the difficulties as well as the ultimate goal in starting from scratch with an expansion team. Coach Brown need not have worried about going winless, however, for the Bengals won their next two games at home, although they came out on top just one more time on the way to a 3-11 record and last place in the Western Division. San Diego won its first three contests, but again finished third in the division at 9-5. Dewey Warren (pictured at left) was replaced by John Stofa the following week and, as one of three quarterbacks who started for the Bengals in their first year, completed 58.8 percent of his 80 passes for 506 yards and a touchdown with four intercepted. Paul Robinson, who scored the franchise’s first TD, had a much bigger year, leading the league in rushing with 1023 yards and gaining All-AFL as well as Rookie of the Year honors. John Hadl went on to lead the AFL in pass attempts (440), completions (208), yards (3473), and TD passes (27), but also in interceptions (32). 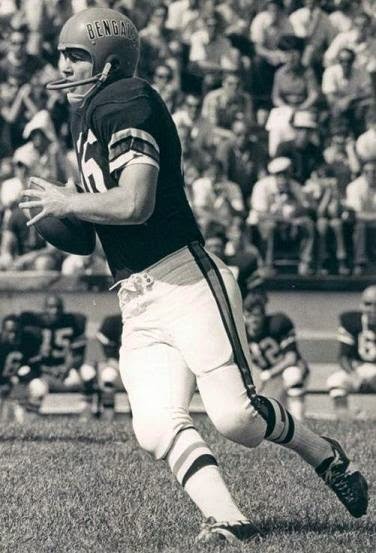 Dickie Post ranked fifth in rushing with 758 yards and Lance Alworth and Gary Garrison both finished over a thousand receiving yards (1312 and 1103, respectively). Willie Frazier remained a backup at tight end and caught 16 passes for 237 yards and a total of three touchdowns. Dennis Partee kicked 22 field goals, the third-highest total in the AFL, averaged 40.7 yards on 56 punts, and spent eight years with the Chargers.